The bdl-3040 is a multicolored laser light display emitter with over 40 different display patterns. It has three operating modes; autorun, sound active and autorun and soundactive auto switching. 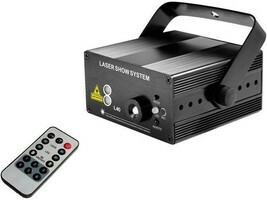 The unit has a built in microphone, laser dimmer and a full function remote control. It can cover over 30' of space with brilliant lights and patterns. It includes a heavy duty steel mounting bracket with 180 degree rotation.